Shop for authentic North Dakota Flags. We offer indoor and outdoor North Dakota flags in durable nylon. Our outdoor flags are finished with a canvas heading, while indoor flags are finished with a lined pole hem and your choice of with or without fringe. 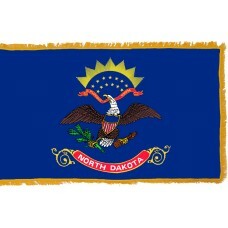 We also offer indoor and outdoor North Dakota flag sets. The North Dakota State Flag features a blue field with a bald eagle in the center that is carrying an olive branch and a set of arrows in its claws. In the eagle's beak, there is a ribbon that says, "E Pluribus, Unum" (which translates as Out of many, one). This ribbon represents the one nation that is made up of many states. On the eagle's breast there is a shield with 13 stripes, which represent the original thirteen states and above the eagle is a fan shape that features 13 stars which represents the birth of the new nation, "The United States." Below the eagle is a red scroll that writes "North Dakota." The North Dakota State Flag was officially adopted on November 9th, 1943 but was used by the North Dakota military in 1911. North Dakota is a state (the least visited state) in the Midwestern and Northern region of the United States of America. It shares borders with Montana, South Dakota, Minnesota, and Canada. The capital city is called Bismarck and the largest city is called Fargo. North Dakota was named after "Dakota" who were the Sioux Indians that inhabited the area for centuries and Dakota translates as "friends." North Dakota is also referred to as "The Peace Garden State" due to the peace garden that sits on the border between Canada and North Dakota. The Peace Garden opened in 1932 to honor the peace between the two nations, and it is also thought to be the longest unguarded border in the world. North Dakota has been inhabited for thousands of years and was occupied with Native American tribes that included the Mandan, Arikara, and Hidatsa. Even though the area had not been properly explored, France claimed the majority of the land after French explorer Robert De La Salle claimed the land West of the Mississippi in 1682. The first European to properly explore the area was the French fur trader Pierre De La Verendrye in 1738. In 1803, following the Louisiana Purchase, the United States of America gained control of North Dakota. Thomas Jefferson sent explorers Lewis and Clark to the area where they built Fort Mandan on the Missouri River to survive the winter. The first permanent settlement in North Dakota was at Pembina in 1812. In 1861, North Dakota became part of the Dakota territory. Not many people were choosing to move or settle there until 1862, when the Homestead Act was introduced. The Homestead Act was a law that entitled American citizens to get 160 acres of land West of the Mississippi River and East of the Rocky Mountains and they could keep the land if they lived on it for five years and improved it in some way. Following this law, many people chose to come to the area and eventually the Native American tribes were forced off their land which caused many battles. 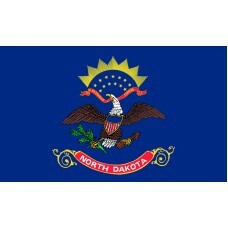 On November 2nd, 1889, North Dakota became a state of the United States of America. It is unclear whether it was the 39th state or the 40th state as South Dakota joined the Union on the same day and President Benjamin Harrison kept it a secret which state he signed first.